Get let your wager go to waste! Insure yourself and claim back €50 Free Bet with Premier League Money Back Offer. 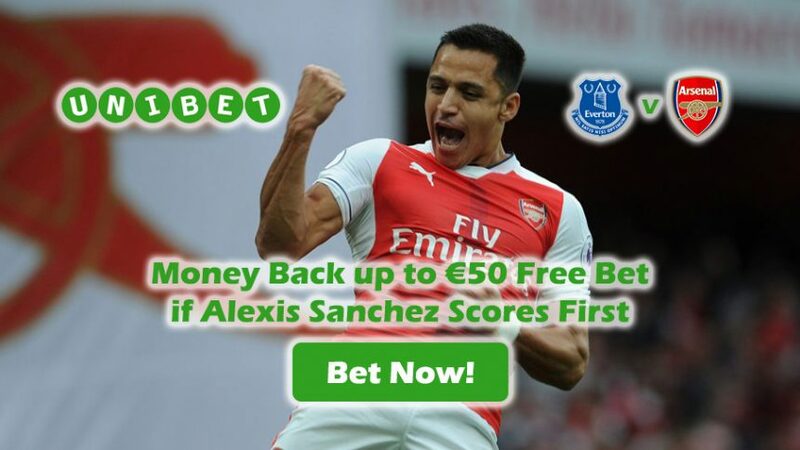 Bet on the Everton v Arsenal match in round 16 today, and if the speedy Chilean Alexis Sanchez scores a goal first in the game, you’ll receive a refund up to €50 Free Bet with the Premier League Money Back Bonus. There’s really nothing to it! All you have to do is place a €5 wager (or more) on ANY market for the encounter at Goodison Park to collect the Free Bet, should Arsenal’s No. 7 find the back of the net first. So far this term, the former Barcelona winger has bagged an impressive 11 goals in 15 outings in the Premier League, so it’s beneficial to protect your bet with Premier League Money Back Offer. The Gunners are favourites 23/25 (1.92) to win the clash at Goodison Park tonight, while a draw between the two stands at 11/4 (3.75), but we’re backing Arsenal to continue their incredible run which has seen them clinch 34 points from a possible 45 until this point in the league. This has granted them second place on the table, right behind Premier League leaders Chelsea, who are three points above them. Despite starting the new campaign in strong fashion, it seems that Everton has now succumbed to poor form. They’ve collected only 20 points thus far, and over the last five rounds the Toffees clinched three losses and two draws, which makes a victory for them tonight quite unlikely, with odds being 16/5 (4.20). Following his spectacular exploits in front of goal and overall important to the team, Arsenal are looking to tie down the Chile international to a long-term deal. Arsenal legend and the all-time top goalscorer Thierry Henry has poured praise onto Sanchez, and is hopeful the 27-year-of will soon put pen to paper on a new deal to stay at the Emirates. Insure your bet with the Premier League Money Back Offer! Insure your wager on the match with Premier League Money Back Offer in case the Chilean winger is first to find the back of the net. Claim a refund up to €50 Free Bet with Premier League Money Back!